I have this little habit of buying more produce than I can use. I just get so excited when I'm standing in front of a pile of gorgeous vegetables or fruits that I don't entirely think things through. I haven't fully decided whether this is actually a "bad" habit or not since it sometimes leads to wasted food (bad) and sometimes to creative new dishes (good). So I am going to resist labelling it for now and spare you all any further inner monologue on this topic. 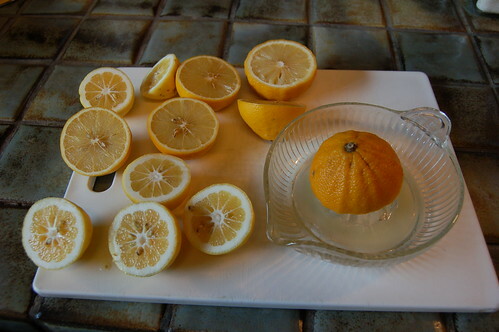 Long story short, I ended up with five bergamot oranges -- Monterey Market was selling this rare (and usually expensive) citrus fruit for only $1.29 a pound last weekend so I clearly had to buy a few, right? Of course I did! For those of you who are not familiar with it, bergamot originated on the Ionan coast of Italy and is a cross between a Seville orange and a pear lemon. Although it may not sound familiar, you probably have come across it before. Do you know that lovely flowery flavor and scent in Earl Grey tea? 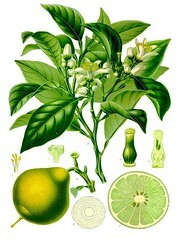 Well it comes from oil of bergamot, an oil that is extracted from the rind of the bergamot fruit! Unfortunately, I had no idea what to do with them once I got them home... I waited a week for inspiration to strike but nothing came to me - no whispered message in a dream, no omens sent from above, not a damn thing! I realized that it was time to take matters into my own hands when one of the fruits succumbed to a vibrant green mold a few days ago. There is no real recipe for my cooler - it's too basic. The first step is to juice the mother 'uckers. Luckily, both fruits are relatively easy to juice as they're soft and bursting with liquid - so much so that they may even fall apart a little while you're juicing them. Then add water and sugar to taste, stir well, and cool. 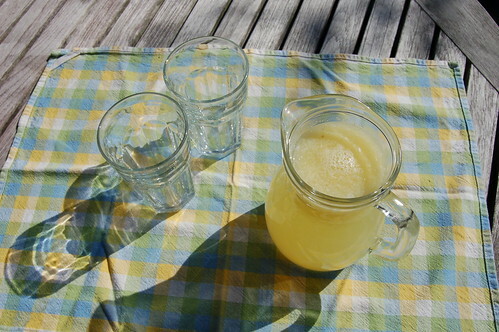 The result is a refreshing and fascinating blend of flavors - mild, flowery, acidic, and sweet. Enjoy! Eve! 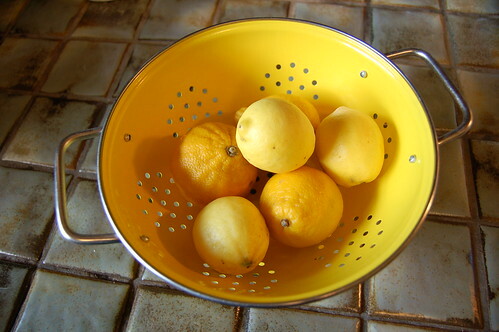 We have the same bright yellow colander! Good excuse to tell me I enjoy Garden of... so much. The attitude, the pictures, the writing - spot-on sensibility towards and about food... So, listen, my latest book, THE CORNBREAD GOSPELS (www.cornbreadgospels.com) would I think be up your alley. May I ask my publisher to send you one? Just e me at crescentATSIGNdragonwagonDOTcom with your snailmail, I'll send it to the folks at Workman, and off it goes. (Unconditional: No review, positive or otherwise, expected). 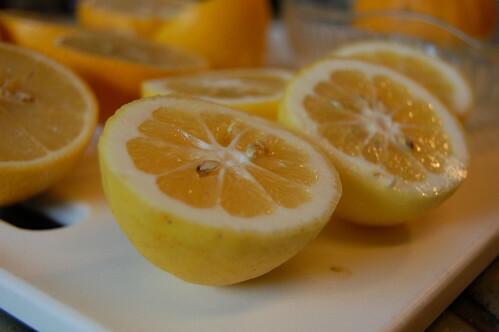 In Iran they make a jam(preserve) with the peel of the bergamot orange. It is commonly known as cedrate jam through out Iran.